After three years of absence in the TV news business, a familiar face made a comeback this week. Adrian Ayalin, longtime ABS-CBN newser, made his return to the Kapamilya Network. Using his Twitter account, Ayalin tweeted: "Back to tell more stories, in the service of the Filipino worldwide," along with an Instagram photo of the ABS-CBN 60th anniversary button pin. 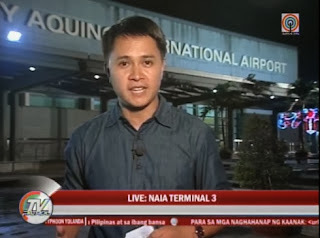 Last night on TV Patrol, Ayalin filed a report about the shooting incident at the NAIA Terminal 3, where a mayor from Zamboanga del Sur and three others were shot dead just before noon yesterday. He also did a report on CNN International and was debriefed by anchor Natalie Allen. Ayalin left the network in January 2010 and worked as an information specialist at the U.S. Embassy here in Manila. Alex Santos moving to Solar News?